Our neighbor Madeline wanted to invite the neighborhood to participate in welcoming the celebrated artist Dr. He Qi at the church on Elmdale this weekend. “His work has been called innovative, passionate, and controversial. There is little doubt that his brilliant colors and striking iconography have made Dr. 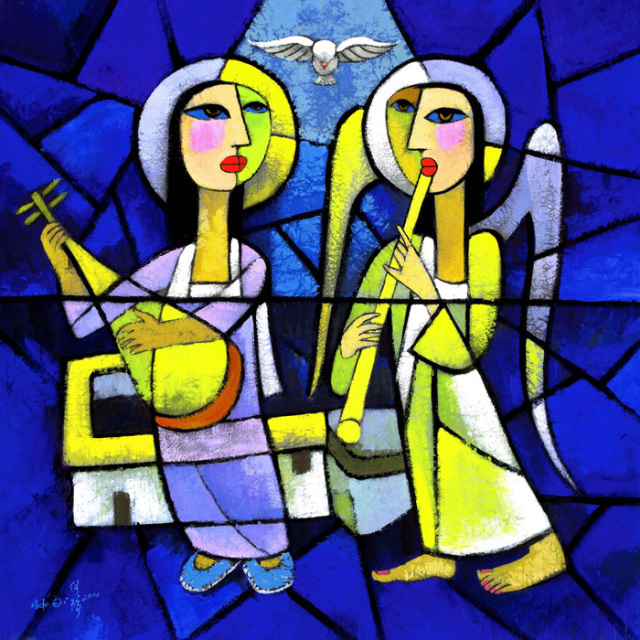 He Qi one of the most admired, sought after (and often copied) Christian artists of our time. As a teenager during the Cultural Revolution in China, his first major work was a portrait of Chairman Mao. After study in China and in Hamburg, Germany, he was the first Chinese person since the Cultural Revolution to receive a PhD in religious art. He was a professor at Nanjing Theological Seminary before coming to America in 2004. Dr. He’s art is a fusion of many traditions. In his works, one can find traces of medieval and Renaissance art, as well as the traditional Chinese crafts of paper cutting and weaving. Some critics have found hints of surrealism in these paintings. Dr. He Qi is a teacher as well as a profoundly talented artist. As a professor of Christian art, he has lectured at Luther Theological Seminary (Minnesota), Princeton Theological Seminary, Yale Divinity School, Oxford University, St. Olaf College, Wheaton College, Alliance Bible College of Hong Kong, Renmin University of China, Toronto University, and Drew University, where he is currently a guest professor. In 2011, Dr. He Qi received an honorary doctorate from Australia Catholic University. In 2013 he was a special guest-artist at the Tenth Assembly of the World Council of Churches. Exhibitions of Dr. He’s work have been presented on four continents. Cities such as New York, New Haven, Washington, St. Louis, Chicago, London, Oxford, Geneva, Aachen, Kyoto, Tokyo, Hong Kong, Melbourne, Nanjing, and Guangzhou have all been graced by his unique artistic presence. A weekend of special events have been planned. Please join us!